In order to be successful in today's competitive market, more and more companies turns to UNS Professional Services for solutions. UNS offers a wide range of professional services to our customers, be it standard or tailor-made service, from system planning, design, implementation, to customized training, day-to-day system maintenance and monitoring. 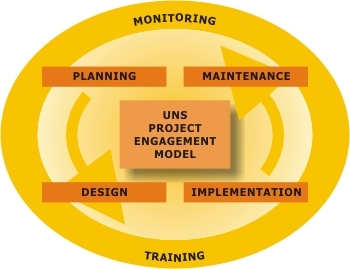 UNS works with customers from their business objectives to develop business application system architecture, security system, network infrastructure build-out, and build our services delivery around each of the process according to our proven UNS Project Engagement Model. All this allows our customers differentiating them from the competition, facilitating cost effective and flexible infrastructure, leveraging critical partnerships and accommodating today's changing market conditions. We use six interrelated process (PDITMM): Planning, Design, Implementation, Training, Maintenance and Monitoring. This proven engagement model is a discipline used to guide a broad range of consulting and allows us to offer services and best solutions to power your business more quickly than anyone else.